In the world of trail cameras, no glow flash is a popular feature, even becoming the new gold standard in game cameras. With this option, your camera is able to take photos without being noticed by anything or anyone around the area. This makes it a demand with manufacturers racing to produce the best quality at a reasonable price. 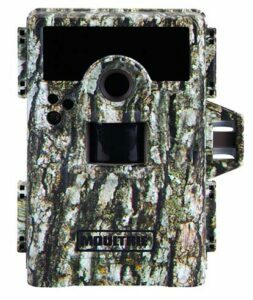 The Moultrie 990i is one of the trail cameras that offer the “No Glow” feature. This camera is popular because it offers a lot of features at a respectable price. Although you pay more for this than some other models available in the market, you can be assured that you will get your money’s worth. The “invisible” flash is a great feature because it does not scare away any wildlife hanging around the area. With this, you are able to capture any activity that is going on in the area. This feature also allows you to use it for security purposes because you are able to capture burglars, thieves and other bad elements without them noticing it. This camera has a quick trigger and recovery time that enables you to see every movement and action happening in the area. You can be sure that you will not miss any opportunity. It also allows you to set it at a time-lapse mode which is great for monitoring food plots and fields. Aside from the “No Glow” flash and quick trigger options, this camera also boasts of other top of the line features. It has a 2-inch color-viewing screen that you can zoom in up to a maximum of 3x. It also has an HD video with sound which is a great tool in identifying the animals in the area. No Glow Infrared has no visible flash, and a range of 70 ft.
All in all, the Moultrie 990i is a solid product. It is even at par with those cameras that even costs twice as much.